Hemlock Bluffs is one of a very few state nature preserves in North Carolina. It is an important location due to its unique flora and fauna. Although it lies in the heart of North Carolina's Piedmont region, the Preserve is home to flora more typically found in the mountains, including Galax (Galax urceolata) and the Eastern Hemlock trees (Tsuga canadensis) for which it is named. In addition, Hemlock Bluffs is a valuable refuge for many species of reptiles, amphibians, mammals, insects and arachnids. Because of its location in the middle of the increasingly urbanized Town of Cary, Hemlock Bluffs also functions as an important corridor for a great diversity of migrant birds that complement many resident specifies of avifauna. Hemlock Bluffs Nature Preserve features many amenities for visitors, including trails, boardwalks, an educational center and gift shop. We invite you to come and enjoy the natural beauty of Hemlock Bluffs. This satellite superimposed map shows the various trails and main features of the preserve. Image provided by Chris Chao. The staff of the Stevens Nature Center at Hemlock Bluffs Nature Preserve offer nature education programs for all ages on almost every day of the year. These programs are developed specifically for Hemlock Bluffs by trained staff members and include nature walks, outdoor exploration, crafts, active learning activities and much more. Custom programs for scout troops, birthdays, school clubs and other groups are also available. The cost is minimal and the experience is always enjoyable. 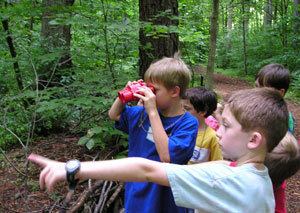 Contact the staff of the Stevens Nature Center to see how you can have a program designed for your group! For specially designed programs, allow a month between scheduling your program and the target date, to allow staff members to develop and review lesson plans. We hope this will provide you with a very special event! 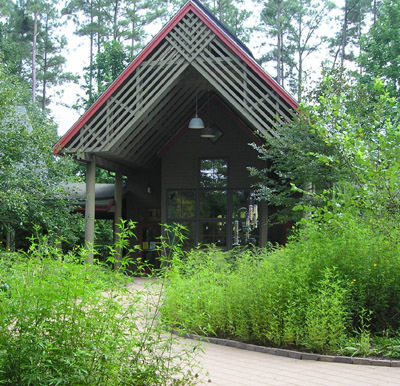 The Stevens Nature Center is a 3700 square foot facility completed in late 1992. The facility hosts an exhibit hall, office space for Nature Center staff, a classroom for program activities and public restrooms. An outdoor education shelter is located adjacent to the Nature Center and is designed to be used for programs and group instruction. The center is named for Colonel William Walton Stevens and his wife, Emily Stevens. Be sure to visit the exhibit hall in the Stevens Nature Center. When you stop in, you can chat with staff and it's a great time to sign up for a program or camps. 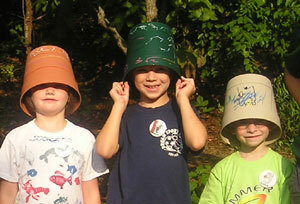 Friends of Hemlock Bluffs Members receive a 10% discount on all programs and camps offered at Hemlock Bluffs. You must register at the front desk in person!. 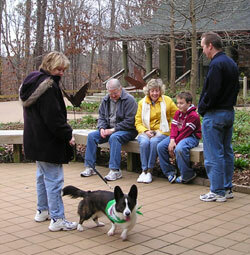 The town website provides information on both the Preserve and Stevens Nature Center grounds and programs. When exiting the nature center, check out the beautiful courtyard gardens, birds, garden art and the engraved pavers! 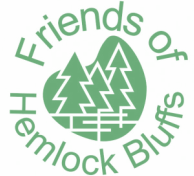 News and updates can be found at the Hemlock Bluffs Nature Preserve website (opens in new window). Please direct questions about Hemlock Bluffs Nature Preserve, volunteering with your group and participating in the nature programs to hemlocks@townofcary.org. Wonder why are there Eastern Hemlock Trees in Cary, NC? The north-facing bluffs around Swift Creek provide a relatively cool and most environment which supports a variety of vegetation unusual to this area. This includes Eastern Hemlock trees (Tsuga canadensis) thriving more that 200 miles from their typical habitat in the Appalachian Mountains. During the last glacial period 18,000 years ago, much of the northern United States was covered by huge ice sheets. Although these did not extend into North Carolina, temperatures in this region were considerably cooler than they are today. Fossil evidence indicates that plant and tree species - like spruce, fir, hemlock and jack pine - now found in the northern conifer forests and in the mountain regions were widespread across the Piedmont during this period. 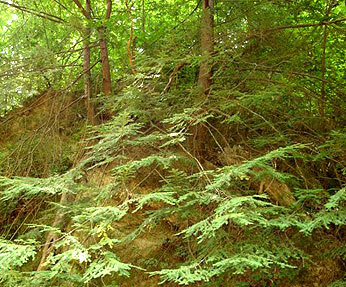 Most of these plant communities disappeared with the retreat of the glaciers, but the hemlock trees of Hemlock Bluffs remain as a unique relic of that ancient world. How were the bluffs formed? Most of the rocks that underly the Preserve are 500 to 600 million years old, and originated as volcanic material. About 220 million years ago, large faults formed in the Earth's crust. Some of these, like the one that runs parallel to the bluffs, filled with quartz deposited from hot water passing through the fractured rock. During the Pleistocene era, the climate was much cooler and quite wet; Swift Creek was a much larger stream. It eroded the softer volcanic rock, leaving the harder rock along the bluffs. You can see large white blocks of quartz near the top of the bluffs. 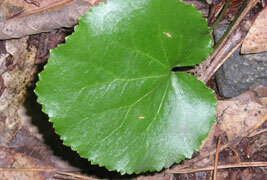 ​Uncommon vegetation is not the only thing that makes Hemlock Bluffs unique. The Preserve also serves as a vital wildlife habitat and breeding group for local salamander populations. The Town of Cary has designated this 150 acre area as a nature preseve to protect this very special ecosystem. A system of trails, boardwalks and overlooks allow visitors access to the area without disrupting the fragile micro-habitat. Hemlock Bluffs has three loop trails which begin just beyond the courtyard of the Stevens Nature Center. 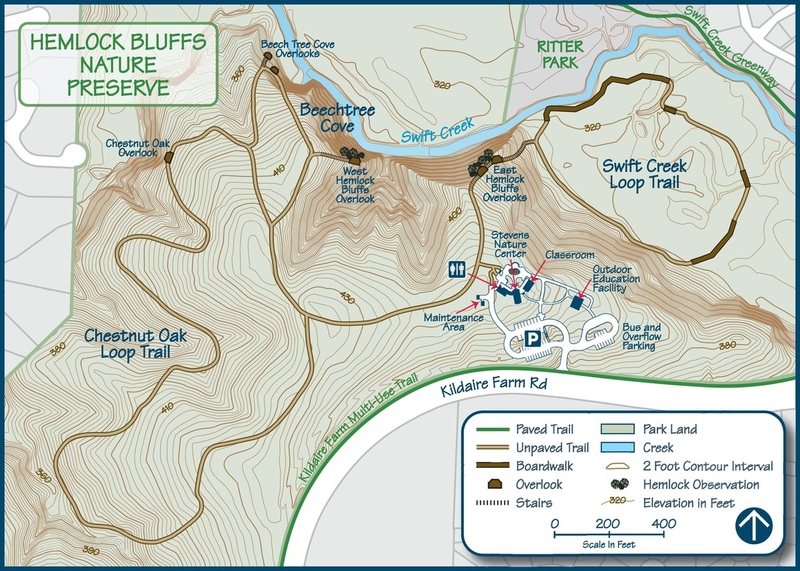 Fifteen point, self-guided brochures of the Swift Creek and Chestnut Oak trails are available to increase your knowledge and enjoyment of the Preserve. Chestnut Oak Loop (shown in red, 1.2 miles) - this is the longest and most rugged trail. Because it is less traveled by preserve visitors, you are likely to encounter shy wildlife such as gray foxes. 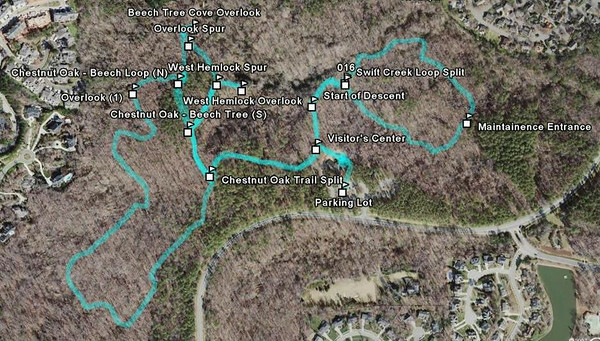 Swift Creek Loop (shown in green, 0.8 miles) - this trail has a beautiful system of boardwalks and a spectacular display of wildflowers in the Spring. On it's long stairway you can stop at the overlooks to view the Eastern Hemlock trees. Beech Tree Cove Loop (shown in yellow, 0.9 miles) - this is the easiest trail to take with a stroller and has the least mosquitoes in the summer. 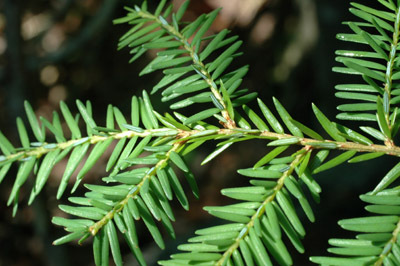 It will take you to the West Hemlock Overlook, where you can see Eastern Hemlocks. Take I-440 towards Cary, then US-1 South towards Sanford. Take exit 98-A Tryon Road. Go to the third stoplight and turn right onto Kildare Farm Road. Go through two stoplights (past Lochmere Golf Course and a shopping center on your left). You will cross over a bridge and round a curve. Look for a driveway on the right. There will be a blue entrance sign visible as you turn into the parking lot. Take I-40 East to exit 293A. This will put you on US-1 South / 64 West. Take exit 98-A Tryon Road. Go to the third stoplight and turn right onto Kildare Farm Road. Go through two stoplights (past Lochmere Golf Course and a shopping center on your left). You will cross over a bridge and round a curve. Look for a driveway on the right. There will be a blue entrance sign visible as you turn into the parking lot. Click on the image below for a MapQuest Map view. Staff requests that guests follow these rules to preserve the natural treasures of Hemlock Bluffs for future visitors. Thank you! Please do not pick or dig live or dead plant materials including flowers, leaves or sticks; these provide valuable nutrients for the animals and soil. Prevent soil compaction by walking only on designated trails and leaving bicycles and horses at home. Smoking and open flames are not allowed. Dog lovers - keep your dog safe and on the trails by keeping him on a six foot leash. Town of Cary ordinance requires cleaning up after your pet when on public land. No hunting, trapping or fishing allowed. Alchoholic beverages are not permitted within the Preserve.